3. These models come with a direct motor drive, and there is no need for displacement during operation. They have high mixed speed and mixed materials efficiently. 1. 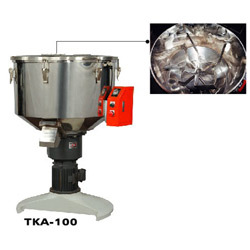 Type: TKA-50, TKA-100, TKA-150. 2. Power(HP): 5, 5, 7.5. 3. MAX.capacity (kgs): 50, 100, 150. 4. Machine N.W. (kgs): 200, 250, 300. 5. Machine dimension(LxWxH)mm: 680x900x1200; 900x900x1200; 900x900x1300.